Taylor Wolf of Durango High School puts the ball over the net while playing the Farmington Scorpions on Tuesday night at DHS. 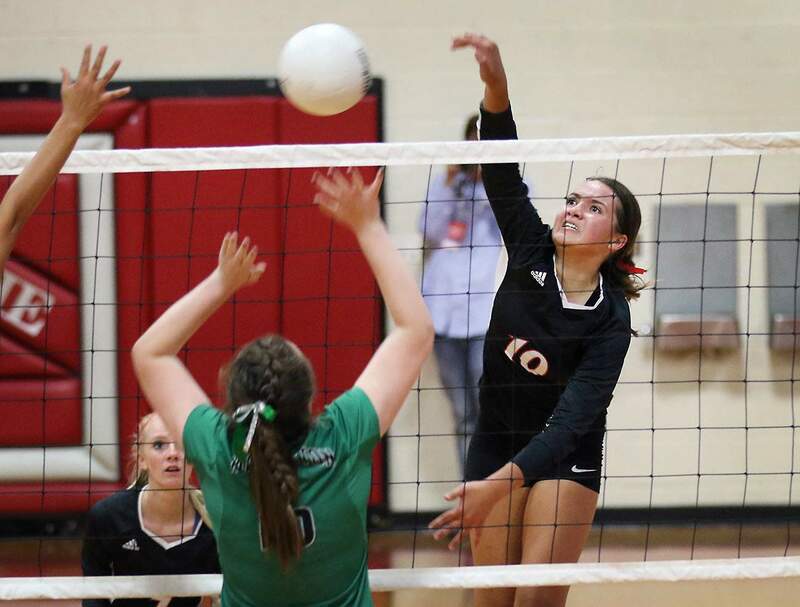 Lily Chick of Durango High School makes a kill shot while playing the Farmington Scorpions on Tuesday night at DHS. Sierra Martin of Durango High School puts the ball over the net while playing the Farmington Scorpions on Tuesday night at DHS. 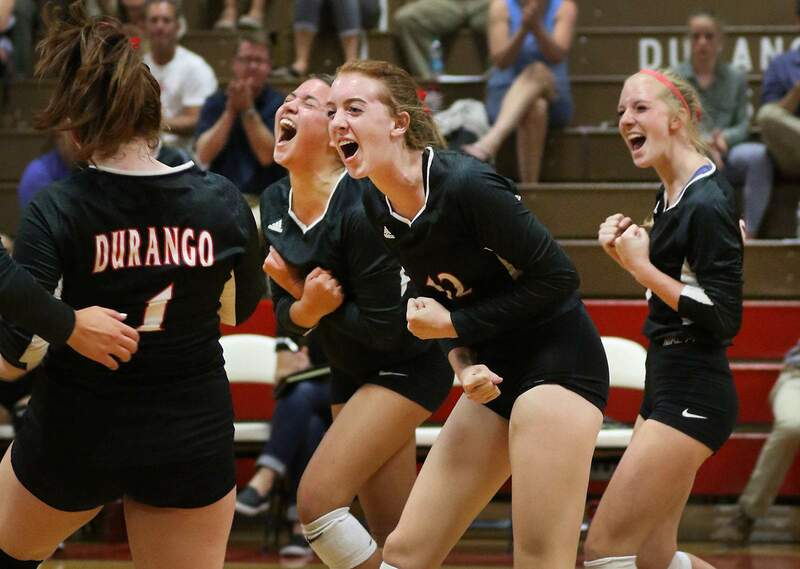 Durango High School players celebrate a point while playing the Farmington Scorpions on Tuesday night at DHS. Durango High School head volleyball coach Colleen Vogt cheers on her players while playing the Farmington Scorpions on Tuesday night at DHS. Taylor Wolf of Durango High School looks to block a shot while playing the Farmington Scorpions on Tuesday night at DHS. 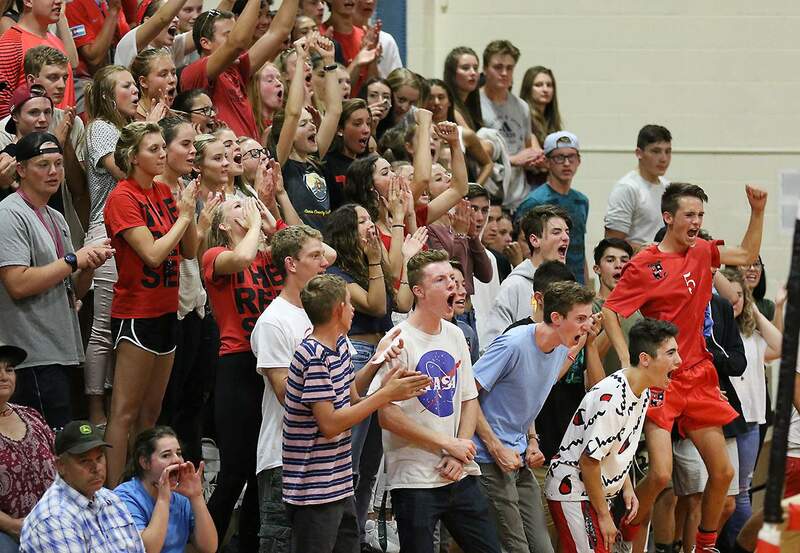 Durango High School students that help make up the “Red Sea” came out to supporting volleyball players while playing the Farmington Scorpions on Tuesday night at DHS. 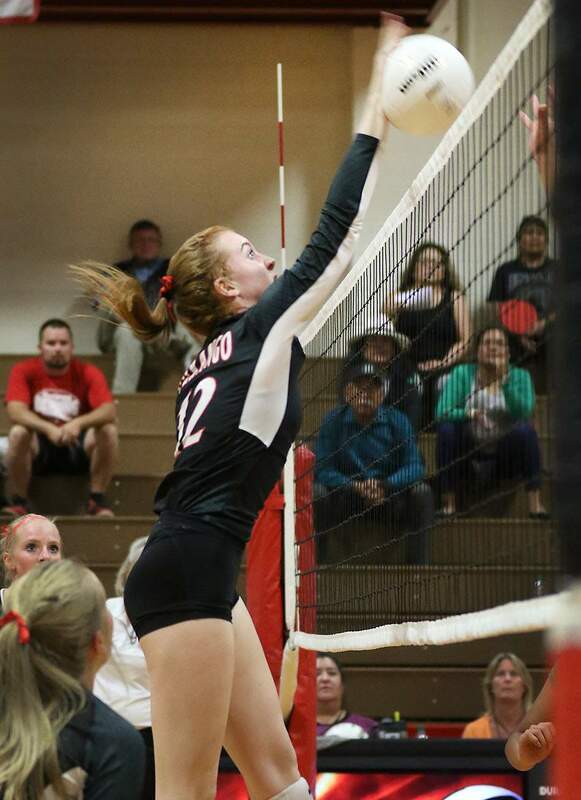 Durango was determined not to get swept on its home floor in its first home match of the season Tuesday. 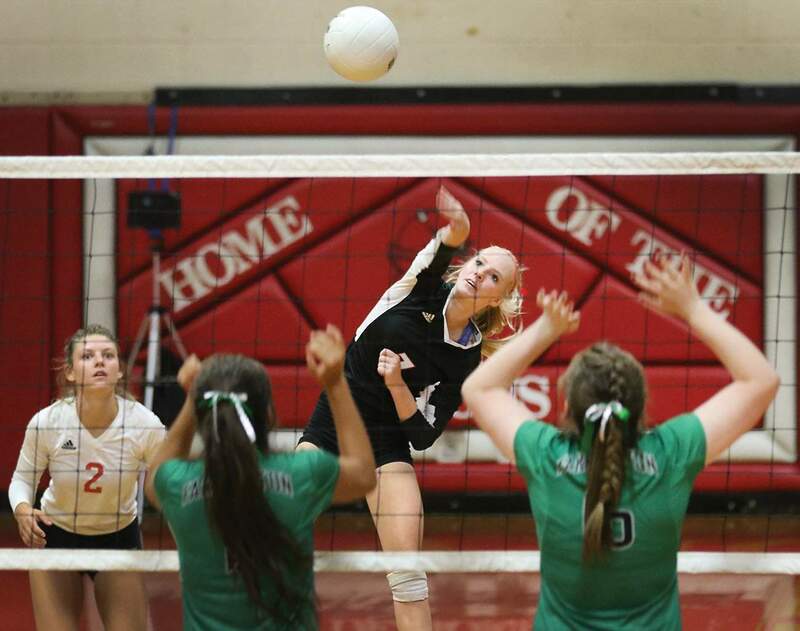 Behind two games to none and trailing 23-21 in the third, the Demons volleyball team didn’t let their heads sink, even after Farmington High School rallied from a 20-13 deficit to even the game at 21-all. The Scorpions (1-0) took a 23-21 lead after an Alyssa Simmons kill, but the Demons (1-1) found an answer in the form of Taylor Wolf. She came up with a game-saving block to even the score at 24-all. She then delivered a kill to give the Demons a 25-24 lead, and it drew a howl from the DHS student section. A net violation on the Scorpions gave the Demons the game, 26-24. Charlotte Hale of Durango High School goes low as she digs a serve while playing the Farmington Scorpions on Tuesday night at DHS. It wouldn’t be enough for the Demons, though. The Scorpions showed their strength in the fourth and final game with a 25-14 win. It backed up wins of 25-22 and 25-21 in the first two games, as Farmington won the match 3-1. The Scorpions’ experience showed, as Farmington boasted a talented group of returning players from a team that claimed a district championship in 2017 before an early exit at the state tournament. 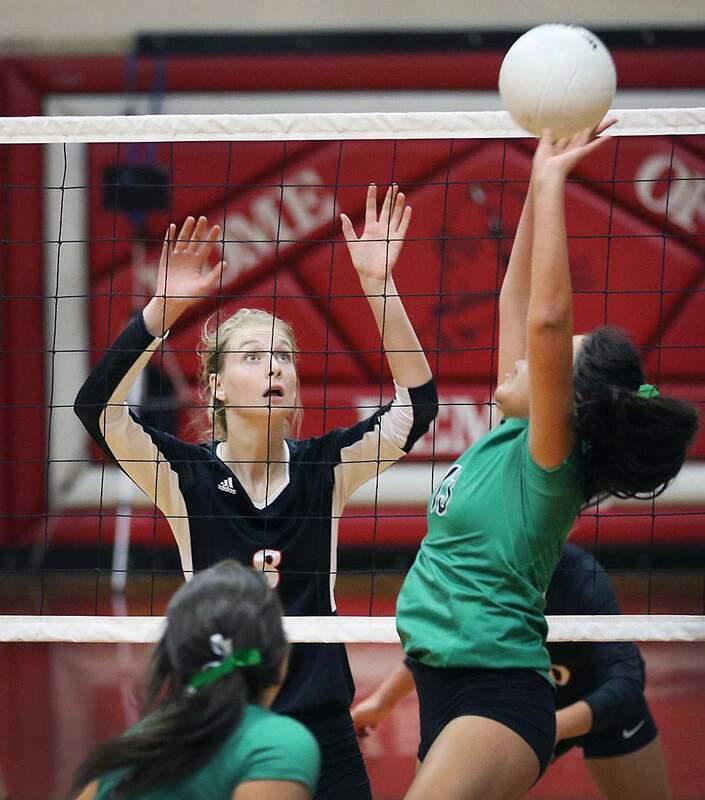 Behind big kills from JJ Curry, Bergen Campbell and Chloe Finch, the team also showed poise. Their court awareness was evident, as they allowed several Durango hits to go out of bounds instead of continuing the volley. 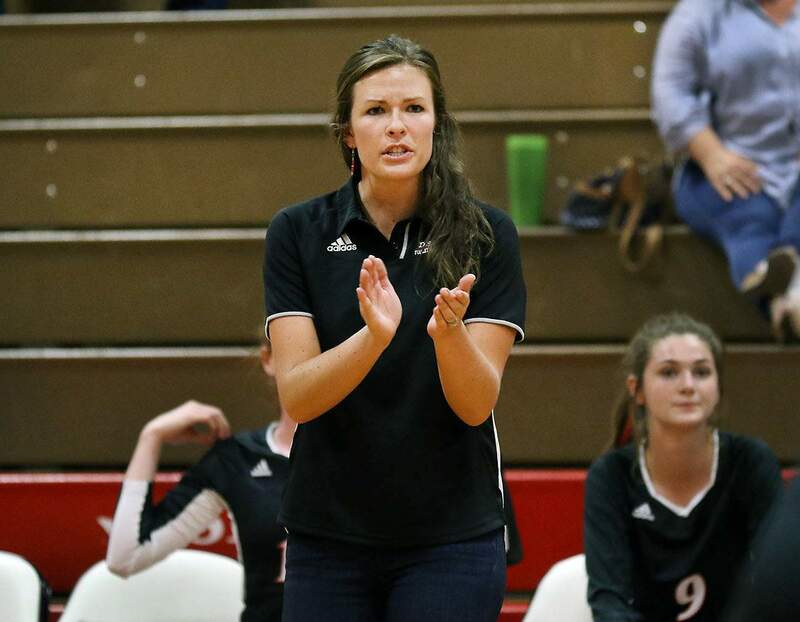 “I’m very pleased with the girls,” FHS head coach Alana Rowland said. “I knew this was going to be a fun match just coming into it. I’ve never been in this gym, but Durango is typically a very strong program. In a close match, the numerous hitting errors for the Demons proved to be pivotal. 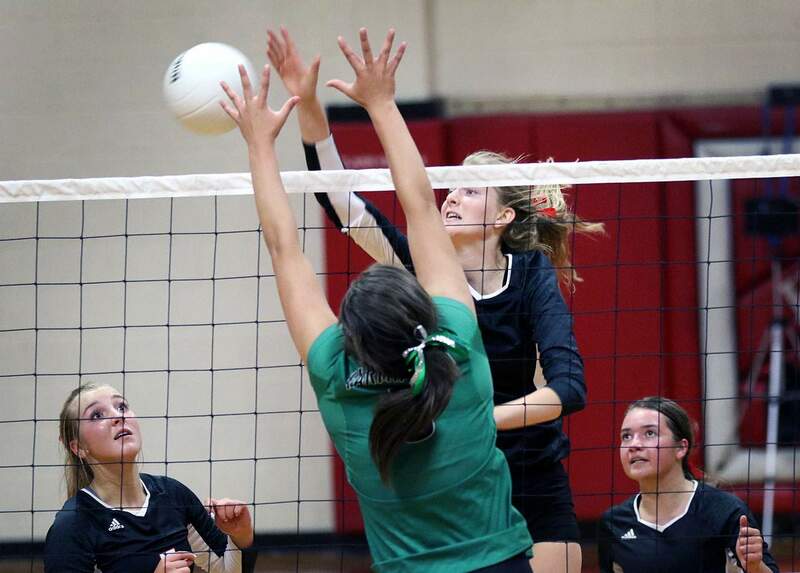 Millie O’Ketter of Durango High School makes a kill while playing the Farmington Scorpions on Tuesday night at DHS. While Durango’s errors were frequent, its play was strong. The Demons drew confidence from senior Lily Chick and rallied around senior Maura Fitzpatrick when she delivered a big kill and block in the third game. 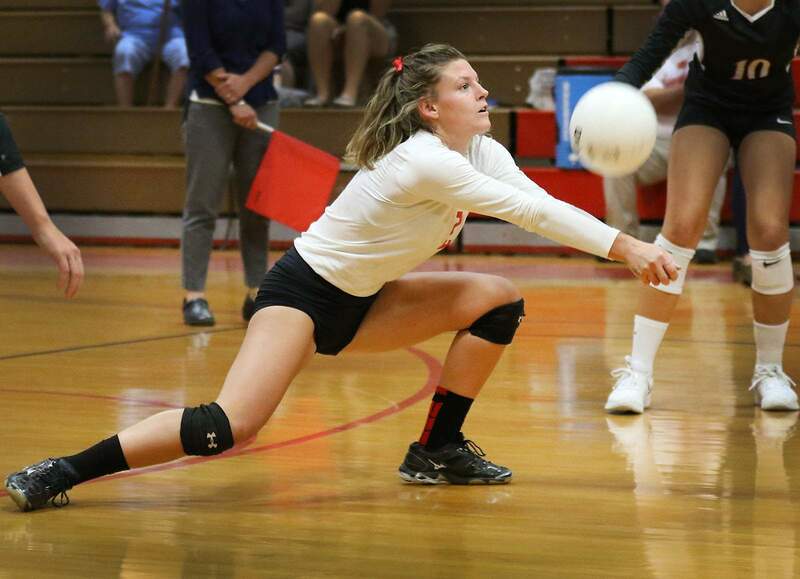 Wolf, a senior middle blocker, showed talent at the net in all areas, and junior outside hitter Millie O’Ketter proved you don’t have to be one of the biggest players on the floor to hit the hardest ball. The serving of senior libero Charlotte Hale also gave the Demons strength in some of their longest sustained point runs of the night. Hale also led the team with nine digs, while O’Ketter had seven. O’Ketter also had a team-high four aces. Sierra Martin led DHS with five blocks, and she also had six kills. Martin also had six kills, while Chick had seven. Durango will play at 6:30 p.m. Thursday at Farmington’s biggest rival, Piedra Vista.